How Much do I Love Camping? I have been thinking a great deal about going back this coming summer to a favourite spot of our family's. We used to go there every summer for a family camping trip, but with all our children working and growing up and dispersing, the last time we were able to go to the spot in question was late in the summer of 2010. Below is my post written shortly after our last trip there. I do hope, if we go this year that the sun will shine more warmly upon those of us able to make the trip and, most of all, that we will be allowed to have a campfire. It really does make all the difference in the cool evenings. Even without a fire, however, our spot is beautiful almost beyond belief. There is a sense of being on the edge of the world there without it taking more than a day's travel from our home. The ocean seems bigger there and the shoreline wilder than any spot near here. I love the ocean and have been missing it as of late. The waves are calling me in the dead of winter and I long to answer their call - when summer comes. I believe I am now completely thawed after camping for five days on the southwest coast of Vancouver Island with a complete campfire ban in effect. We are experienced coastal campers but nothing could have prepared me for camping in damp windy conditions without the benefit of a fire in the evenings. I wore all the wool I brought and went for many walks on the beaches dressed like it was January. My husband and children did not seem to feel the cold nearly as much as I did. They dressed warmly, but were not desperate about it. One day found me pacing around our campsite with a wool blanket tied around my waist like a sarong. My husband took to calling me 'Nanuk', but by the end of the week, even he said next time we camp at French Beach we should come earlier in the summer, when the possibility of a campfire ban has not yet taken effect. The forest floor of the campground was littered in gold and brown leaves from the overnight fall-like temperatures, but we were mercifully cozy in our tents and sleeping bags at night, and slept well, looking forward to hot chocolate and coffee made on the Coleman stove in the morning. We had glorious days on the beaches, hunting for tidal life, scanning the horizon for dolphins (we saw a group of three) and whales (we were blessed with a visit by a grey whale feeding in the kelp beds just off shore at Botanical Beach near Port Renfrew), and warming up on the sunbaked stones littering French Beach and China Beach. At one point I sat on French Beach, picking up warm stone after warm stone to hold in my frigid hands. We played round after round of badminton and tossed the football, and no one complained about taking their turn to do the dishes after every meal in a pan of hot water. We were gratefully distracted from the wind on our second afternoon with a visit from my brother, his family and a couple of nephews, and enjoyed showing them around China Beach - a long stretch of fine sandy beach accessible only by boat or by a short hike through a forest of huge arrow-straight Sitka Spruce trees once used for masts on tallships - which they thought was truly beautiful. We had brought a gas lamp with us and after we found it emitted a generous amount of heat we joked about it being our impromptu campfire, placed it on the fire grate and gathered around it every evening just to stay somewhat warm while we sat and talked about the day and shared stories and favourite scenes from well-loved comedy programs. The last day we hiked into Mystic Beach and enjoyed the sheltered bay there. We lingered in the warmth, exploring the caves created in the cliffs by the tide, and visited the waterfalls. I was clicking away with my camera when a fellow hiker offered to take a family photo, and I think it will make a great Christmas card this year. Soon after, our daughter Emma stood on a rock near the shore. The tide was coming in then and my boys thoroughly enjoyed watching their sister get soaked by a large rogue wave that hit her at chest height. Good thing I had packed an extra jacket. The last evening after supper was cleared away we walked on French Beach and remarked on the darkness of the clouds heading toward us. We decided to string up a tarp over the picnic table in case of rain, so at least we would have somewhere dry to cook and eat in the morning. We were so glad we thought of it, because it rained fairly hard all night long. After breakfast we packed up the wet tents cheerfully, anticipating the dry warmth we would return to here at home. Do I love camping? Not necessarily in the aforesaid conditions. But what I do appreciate about camping is the unobstructed family time, the simplicity of choosing meals suitable for cooking over a two burner camp stove, the 24/7 outdoor living by the briny fresh sea, the inaccessibility of technological gadgets, my husband being well out of cell phone range so he can't be bothered with work, and the appreciation it gives me for the simple things of everyday life - like a hot bath and a solid roof overhead. 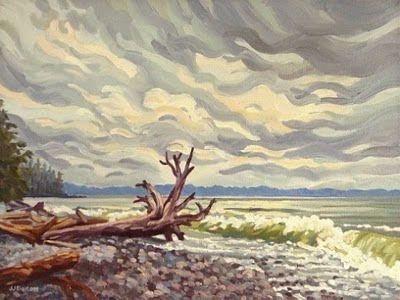 The painting above of the large piece of driftwood on French Beach is called 'West Coast Wanderer' by Victoria, B.C. artist Jeffrey J. Boron. More of his work can be found here. I was reading a post by one of my very favourite blogger friends, Lucille over at Useful or Beautiful, when I was struck with an idea for a little post of my own. She was writing about all the shoes she wore when she was a child growing up in England. She mentioned a pair of fabric party shoes that became worn out in one wearing due to the energetic nature of the party games: Squeak Piggy Squeak, Blind Man's Bluff, Oranges and Lemons, Musical Chairs and Musical Statues. I am old enough, and Anglified enough, to be familiar with a couple of the games she mentions playing in childhood. I am not going to write about my girlhood shoes, which, besides one pair of super-trendy white canvas Nike runners with the blue swoosh and my first pair of platform sandals, were unremarkable. I am going to write about the games we played in my neighbourhood because, friends, those were some very good times. My neighbourhood on Silica Street was a lot like many other neighbourhoods in the world at that time in the century, I am sure; it was full of families. On a good night we could have fifteen kids playing outside after supper. The only reason to stay inside on a non-rainy night was a case of the flu or too much homework. The other kids we played with on those nights did not have to be necessarily approved of/interviewed by our parents. We did not even have to like each other all that much. The games we played demanded numbers to be successful and fun, and numbers we could provide simply by showing up. The sheer joy and enthusiasm we had for the games was generally enough to carry us through any personal conflicts with other kids. In summer we played Hide and Seek or Sardines. In Hide and Seek, boundaries for hiding were agreed upon and one person who was 'it' counted to fifty before beginning to seek for the rest of us. The boundaries included anywhere within our block, including the alley. In Sardines, only one person hid somewhere within the boundaries and everyone else separated to look for them after counting to fifty. The hiding spot had to be large enough to accommodate each 'finder' who would join the 'hider' once he/she was found. We would be packed into the hiding space like sardines in a can, trying not to make any noise whatsoever, and the last person to find the 'hider' was 'it'. We also played a game called War, which involved painting a chalk circle on the street and planning various manouvers to take over portions of the circle. When fewer of us were available to play we relied upon Four Square, Hop Scotch and various skipping games. On summer days we played in the shady public wooded area on the north side of our street. We built treeforts which were taken down by the city only to be rebuilt by us at the first opportunity. During the fall we collected glossy brown horse chestnuts from the same wooded area and kept them in paper bags. Someone among us convinced her dad to drill holes in her chestnuts so she could make a necklace, but other than that, chestnuts were greatly averse to being made into things. We often threw them at each other instead, used them for made-up games, or when some of us were really bad, we threw them at passing cars from up in the canopy of the trees that overhung the street. In winter, when the snow fell fast and deep the city closed Cedar Street, which was so steep drivers had to put their cars in the lowest gear to make the descent. Then, word would spread quickly and we would all jump into our snowsuits, boots, mittens and touques, grab our Crazy Carpets and go. Cedar Street was long and if we did not bail off our Crazy Carpets after the first long block we would have to climb up an extra-long way. By the end of the night, discarded, snow encrusted mittens and touques littered the sides of the street while we, red cheeked, hot and sweaty, climbed up the hill to race back down once more before we were called in by our parents to get ready for bed. When we got older we went further afield for tobogganing. Queen Elizabeth Park and Trafalgar Junior High had grassy slopes on which to sail down into the sports fields. The golf course way up at the top of town provided perfect tubing - people, including my elder teenaged siblings, drove up there with inner tubes and made wide tracks on the rolling slopes that seemed to go on for miles in the moonlight. While my own children enjoyed playing outside daily with other children when they were small and we lived in a small resort community with other like-minded families, it took a little while before they found children to play with in our own neighbourhood in the town we currently live in. While we did see children riding bikes around our neighbourhood and were heartened when we saw groups playing road hockey or basketball in the park up the street, we could not help but wonder why our neighbourhood was not teeming with kids playing games of all sorts outside together. My children, however, played outside our house all the time and soon attracted a few others from the neighbourhood to play road hockey, ride around on bikes and skateboards, and play various games as well. Now that my children are grown, I still wonder, when I am out and about why I do not see more children out playing - school and organized sports are not the only places to learn social skills and fair play. A few years ago our neighbourhood school built a hill in the center of the fields and also more recently installed brand new playground equipment thanks to a large donation from NHL hockey players Henrik and Daniel Sedin. The Sedin twins have set up a fund to encourage families in small communities to play and exercise more. The hill and equipment both get a fair bit of use from young neighbourhood families, which is encouraging. Various movements, such as Bring Back Play, encouraging healthy, unscheduled play for kids are happening in Canada as well. We forty-somethings know what our nation's kids are missing in modern life and are trying to reinstate some kind of desire in families to get outside and play on a regular basis. A friend of my sister's recently posted a photo on Facebook of their high school senior band enjoying a summer picnic at someone's lakeshore property some time around 1980. The photo included about twenty students. Not one teenager in the group lacked the appearance of great health and physical fitness. In fact, they looked like a bunch of young movie stars or professional athletes by today's standards. Unlike the kids of today, they had no Starbucks White Chocolate Mochas, Tim Horton's Ice Capps or Monster Energy Drinks to pile on empty calories back then. A sedentary lifestyle was unusual for a teenager and engaging in some risk-taking behaviours like cliff-jumping was the norm - at least where I grew up. Parents are fed so much fear these days about what 'could' happen to our children we are afraid to let them out of our sight. I am not saying it is easy for me to let my thirteen year old waif of a daughter walk downtown by herself, or ride her bike to the swimming pool alone. I have been fed the same fears for her safety, but I make myself let her go because she is learning to trust her instincts, to discover her own boundaries and get some exercise in the process. As a forty-something mom who values the outdoorsy, independent childhood of my own generation and the good seeds it sowed for a healthy adulthood, mentally, emotionally and physically, I owe her that much. represents high school at that time, and to some extent modern times, with uncanny accuracy. Gomez and Pugsley are enthusiastic. Morticia is even in disposition, muted, witty, sometimes deadly. Grandma Frump is foolishly good-natured. Wednesday is her mother's daughter. A closely knit family, the real head being Morticia - although each of the others is a definite character - except for Grandma, who is easily led. Many of the troubles they have as a family are due to Grandma's fumbling, weak character. The house is a wreck, of course, but this is a house-proud family just the same and every trap door is in good repair. Money is no problem. My daughter is double-casted (meaning she shares her alternating roles with another young actress) as Grandma and as a 1960's flight attendant, or stewardess as they called them in those days, in the chorus of undead ancestors. The production is on a large scale and will have a two week run in the new, and quite swanky, cultural centre in our nearby, mid-sized city which is also home to the school of performing arts which she attends for classes and rehearsals. I have not read the script, but I have a skeleton of the story thanks to my daughter's general enthusiastic chattiness, as well as a good idea of the various songs and dances - she practices in the house, of course. We have, thankfully, a room with a door on it downstairs where she can feel free to make all kinds of delightful vocal noise, and a large square of plywood on which she hones her tap sequences. When our girl first began to practise her parts she would only do so when we were out. She has come a long way. Now she gleefully shows us videos of her and her castmates working on their routines which the director has filmed and posted on a secret Youtube channel, and eagerly demonstrates her dance moves. The school of performing arts is her second home and she loves everyone there and everything about it. Kids aged twelve to eighteen attend the school's Mainstage program and kids from tiny tots on up take all kinds of other classes and programs. Our daughter started with a couple of summer camps and then took two year-long programs before she asked to join the Mainstage program. Even though the program is a huge commitment from the kids and their parents, we agreed. Her sister was leaving home last September to attend college and our youngest would be the only one home during the school semesters. In order to help her forget how much she missed her siblings we helped her with her audition for the musical and enrolled her in the program. Little did I know how much I, too would become involved. No, I will not be acting, singing and dancing in The Addams Family. I will be helping backstage as part of the production crew. I am learning new words like 'fly system' which are weighted ropes that are pulled with a certain amount of skill and muscle to move the set pieces up and down on horizontal pipes hung from the rafters above the stage, and 'main rag' which is the big, red velvet curtain which can be used to hide more involved set changes or to indicate the opening or closing of the performance. Tomorrow evening I will be learning what I need to do backstage for the entire show. I will have to be up past midnight many nights from now until the end of the show. Considering I am generally in bed by ten o'clock I will have to drink some extra coffee in the afternoons so I do not nod off in the cozy dark of the backstage area during the show. Then, we have 'cue to cue' rehearsals on the weekend, followed by two dress rehearsals on Monday and Tuesday, preview shows on Wednesday and Thursday, and then opening night on Friday. I am glad I am not one of the performers. During our safety tour of the backstage area of the theatre the other night, I faced the rows and rows of seats from the stage and imagined them filled with people awaiting and expecting the performers' best. I confess I gasped at the thought. But the kids? They seem fearless. Those who catch the acting bug seem to thrive on performing in front of crowds. My daughter has certainly caught the bug, but even she has confessed to being a little scared and nervous. She has never performed for such a large audience, not since her elementary school choir shows when the audience was filled mainly with parents. She is also tremendously excited to take the past four months' practise and rehearsal and preparation and throw it at an audience. For my part, I merely hope I can support her and the other kids by doing whatever it is I have to do backstage properly. I will take a break to watch at least once from the audience, though. My husband and I are going to attend the opening night performance and gala.